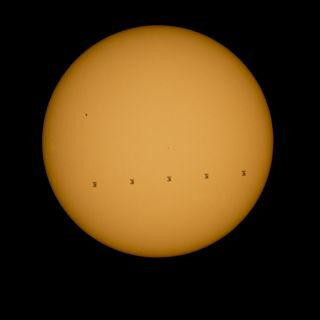 An amazing new photo shows the International Space Station crossing the sun's face. The picture, a composite of five images taken Sunday (Sept. 6) from Shenandoah National Park in Virginia by NASA photographer Bill Ingalls, captures a "transit" of the International Space Station (ISS) across the solar disk. Such transits don't last very long, because the space station zooms around Earth at more than 17,000 mph (27,000 km/h) — the $100 billion complex completes one lap around our planet once every 90 minutes or so. Transits can offer more than just aesthetic appeal. For example, in the 18th century, astronomers were able to calculate the distance from the Earth to the sun by carefully observing two transits of Venus across the sun's face (one in 1761 and the other in 1769) from various locations around the globe. And NASA's Kepler space telescope has spotted thousands of potential exoplanets by detecting the tiny brightness dips they cause when crossing in front of their stars from the observatory's perspective. The ISS is currently staffed by nine space fliers. But three of them — cosmonaut Gennady Padalka, Denmark's Andreas Mogensen and Kazakhstan's Aidyn Aimbetov — will come back to Earth Friday (Sept. 11), returning the orbiting lab to its normal complement of six crewmembers. Editor's note: If you capture an amazing photo of a night sky view and want to share it with Space.com, send images and comments in to managing editor Tariq Malik at: spacephotos@space.com.